Jan. 1. More than 2000 students in Beijing stage a rally in defiance of new regulations limiting demonstrations. 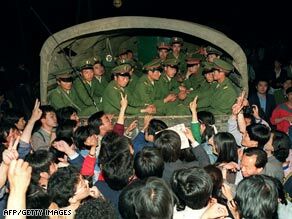 Pro-democracy demonstrators stop a truck with soldiers on its way to Tiananmen Square on 20 May, 1989. Jan. 6-9. The official People's Daily and other state-run newspapers carry front-page condemnations of student demonstrations as harmful to the country and warn against "bourgeois liberalization." A 1984 speech by Deng Xiaoping attacking those who advocate "bourgeois liberalization" is published by the People's Daily at the same time. Jan. 29. Premier Zhao Ziyang says the campaign against "bourgeois liberalization" will be limited and will not interfere with ongoing economic reforms and the opening of China to foreign investments. March 25. Zhao warns that it would never be "permissible to stifle democracy on the pretext of opposing bourgeois liberalization." Mar 28. Vice Premier Li Peng announces the State Education Commission's revival of the Cultural Revolution practice of sending college students to work in the countryside and factories to learn from peasants and workers. July 5. More than 1 million students are assigned to compulsory work in the countryside during summer recess. Nov. 2. Premier Zhao Ziyang, 68, is elected party General Secretary and named first vice chairman of the Central Military Commission. Dec. 7. About 1,000 students march in Beijing to protest the death of Zang Wei, a student at the University of International Business and Economics, who was reportedly stabbed to death by local thugs at a campus store. Students charged Zang died because of university delays in getting him to the hospital. Mar 24-25. The Chinese government announces plans to reduce the number of students going abroad by about two-thirds. June 3-12. Hundreds of Peking University students march to Tiananmen Square to protest the murder of a fellow student by a gang of thugs near the campus. Posters criticizing the government's education policies and democratization go up on campus. June 15. He Shang (River Elegy), a controversial television documentary criticizing the state of Chinese civilization and culture, is aired for the first time. Weeks later, hard-liners attacked the film as "nihilist" and "reactionary." Sept. 26-30. The Central Committee endorses Premier Li Peng's new policy to slow the pace of economic reform, a severe setback for General Secretary Zhao Ziyang. Li also announces that for at least the next two years the government will not embark on new reforms. Feb. 25-27. U.S. President George Bush's visit to China is marred by the refusal of the Chinese police to allow Chinese dissident, Fang Lizhi, to attend Bush's banquet. In a meeting with Bush, Zhao Ziyang sternly warns Americans to stay out of China's internal affairs. April 15. Former CCP General Secretary Hu Yaobang, who was forced to resign in disgrace in January 1987, dies at age 73. April 16. Thousands of students gather at Tiananmen Square to mourn Hu's death. The students viewed Hu as a symbol of anti-corruption and political reform. April 21-22. Defying government orders forbidding demonstrations during the official memorial ceremonies held for Hu in the Great Hall of the People, thousands join the students at Tiananmen Square, demanding freedom and democracy. April 26. The People's Daily publishes a controversial editorial denouncing student demonstrators as a "small bunch of troublemakers" and threatening a government crackdown. April 29. After the government refuses to meet with student leaders, demonstrations are held in Beijing, Shanghai, Nanjing and other major cities, demanding democracy and freedom of the press. May 4. A massive march commemorates the 70th anniversary of a historic student protest movement and coincides with an Asian Development Bank meeting in Beijing. May 13. In Tiananmen Square, thousands of students begin a hunger strike. May 14. At a secret Politburo meeting, Zhao Ziyang's moderate line in handling the student demonstrations is reportedly adopted. The policy calls for a direct dialogue with student leaders and limited measures to implement democracy within the party. May 15. Soviet President Mikhail Gorbachev arrives in Beijing for the first Sino-Soviet summit since 1959. Because of the hunger strike and continuing demonstrations, the welcoming ceremony is held at the Beijing airport instead of Tiananmen Square. May 18. More than 1 million people take to the streets in Beijing to support the hunger strikers. May 20. Martial law is officially declared by Li Peng in "some parts of Beijing." Speaking to a selected audience of party leaders, President Yang Shankun justifies martial law and the deployment of troops in the capital to "keep order." May 25. Premier Li calls on the troops to "overcome difficulties and carry out martial law." May 27. Some student leaders urge demonstrators to end the occupation of Tiananmen Square, but others escalate their demand for Premier Li to step down. June 2. Unarmed troops try to enter Tiananmen Square and are pushed back by student demonstrators. June 3. Armed soldiers begin to move to Tiananmen Square. Clashes between soldiers and civilians break out on the western and southern outskirts of Beijing. June 4th. Troops in armored personnel carriers and tanks crash through barriers set up by protesters and fire at students and city residents, killing many. June 6th. Protest leader Liu Xiaobo, later branded by Beijing as a "black hand" behind the unrest, is arrested while riding a bicycle in Beijing. June 7. Pro-democracy Astrophysicist Fang Lizhi, his wife Li Shuxian and son Fang ke take refuge in the U.S. embassy in Beijing. June 9. Deng Xiaoping, who had not been seen in public since his meeting with Gorbachev on May 16, appears on national television to congratulate the commanders of the martial-law troops. June 10. The Beijing municipal government announces the arrest of more than 400 people, including students, intellectuals and labor leaders. June 13. The Public Security Bureau issues arrest warrants for 21 leaders of the Autonomous Students' Union of Beijing Universities, including Wang Dan and Uerkesh Daolet. June 23-24. Following an enlarged Politburo plenum (June 19-21), the Central Committee meets in Beijing to endorse the crackdown and condemn Zhao Ziyang. Zhao is stripped of all leading posts and replaced as party General Secretary by Shanghai party chief and mayor Jiang Zemin. June 27. The National People's Congress opens after a nine-day postponement. The body endorses the crackdown of the "counterrevolutionary rebellion" and joins the call for tighter ideological control. June 30. In a report to the National People's Congress Standing Committee, Beijing Mayor Chen Xitong details criticism of deposed party chief Zhao Ziyang. July 29. The People's Daily publishes a Politburo decision to 1) purge state-controlled companies; 2) prohibit children of high cadres from engaging in business; 3) stop the "special supply" of food to top party leaders; 4) strictly regulate the use of official automobiles and forbid luxury sedan imports; 5) prohibit the use of public funds for dinner parties or gifts; 6) strictly control foreign travel and 7) investigate cases of corruption, bribery and other crimes.